A practical handbook for making management great again Managing for Happiness offers a complete set of practices for more effective management that makes work fun. Work and fun are not polar opposites; they're two sides of the same coin, and making the workplace a pleasant place to be keeps employees motivated and keeps customers coming back for more. It's not about gimmicks or 'perks' that disrupt productivity; it's about finding the passion that drives your business, and making it contagious. This book provides tools, games, and practices that put joy into work, with practical, real-world guidance for empowering workers and delighting customers. These aren't break time exploits or downtime amusements they're real solutions for common management problems. Define roles and responsibilities, create meaningful team metrics, and replace performance appraisals with something more useful. 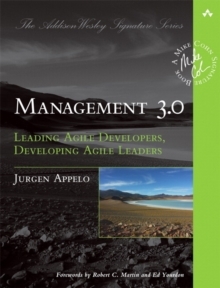 An organization's culture rests on the back of management, and this book shows you how to create change for the better. Somewhere along the line, people collectively started thinking that work is work and fun is something you do on the weekends. 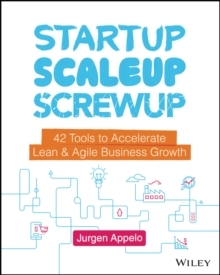 This book shows you how to transform your organization into a place with enthusiastic Monday mornings. * Redefine job titles and career paths * Motivate workers and measure team performance * Change your organization's culture * Make management and work fun again Modern organizations expect everyone to be servant leaders and systems thinkers, but nobody explains how. To survive in the 21st century, companies need to dig past the obvious and find what works. What keeps top talent? What inspires customer loyalty? The answer is great management, which inspires great employees, who then provide a great customer experience. 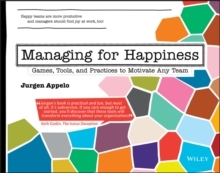 Managing for Happiness is a practical handbook for achieving organizational greatness.